This is a reprinted edition. Cover and inside pages are nice and clean. Former owners name written and marked out on inside front cover. No map. 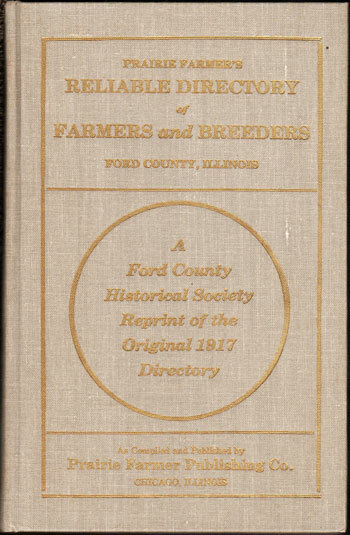 A directory of farmers that includes the name of wife including her maiden name, names of children, size and location of farm, year settled in Ford County, Illinois. Hard cover, reprint edition, 154 pages. Also includes numerous business ads. The book described above is priced at $21.95 plus $1.95 shipping. If you wish to pay by credit card, please use the shopping cart below (checkout goes to a secure server.) Credit card orders may also be placed by phone to Hearthstone Legacy Publications from 9 AM to 11 PM (Central Time Zone) Monday thru Saturday at 816-204-7593.